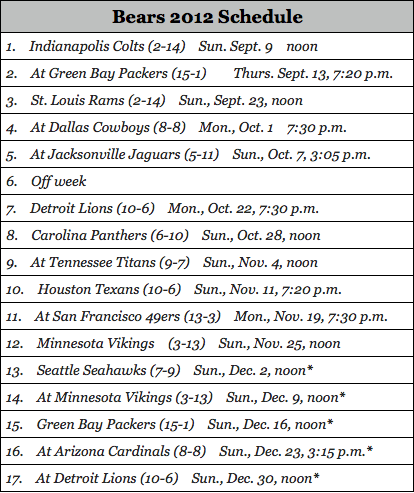 The wait is over ladies and gents, the official 2012 NFL schedule was released tonight. You may think football season is just a mere idea this early on, but you have to plan ahead and mentally prepare! 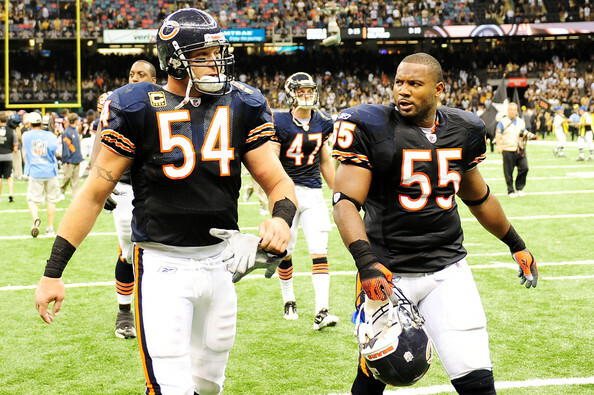 After a rough end to the 2011 season, analysts wouldn’t think the Bears are a prime contender for the Lombardi trophy, but the NFL has them playing five prime-times games this season. The Bears have a Thursday night game Week 2 in Green Bay and three Monday Night Football games. For the third year in a row the Bears will open their season at home. In a press conference Lovie Smith said, “I love starting the season at home in front of our fans. I don’t think there is a better place to kick off the season than playing at Soldier Field on the lakefront.” Preach. All in all, it’s going to be an interesting season. As always, the Bears will have grueling competition in the NFC North. The Green Bay Packers and Detroit Lions will be meaner and deeper than ever – What’s new? Bring it on NFC North. Bring. It. On.